Keep up to date on all the latest happening at the beach! Read our quarterly Newsletter and, The Roar, our occasional blog. Fill out the form below to be added to our mailing list. 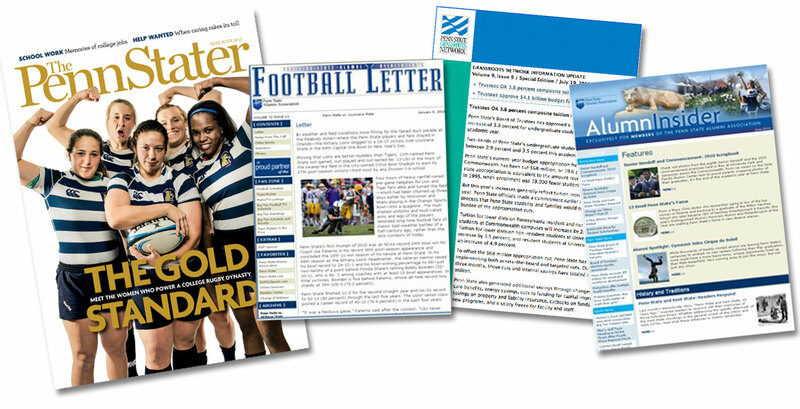 There are a ton of great publications to keep Penn State Alumni all over the world informed. Check out the great publications below, and remember to sign up for our newsletter at the bottom of the page! Published in various forms and under several different names since 1910, the bi–monthly, award–winning Penn Stater magazine features compelling stories about Penn State and Penn Staters. Between issues, follow the magazine’s staff on The Penn Stater Blog and follow them onFacebook. For more than 75 years, The Football Letter has covered Nittany Lion football from its one-of-a-kind perspective. Today, members receive The Football Letter in their email inboxes each Monday morning during the season. This monthly e–newsletter keeps Grassroots Network members updated on the legislative education and advocacy efforts coordinated by the Alumni Association. AlumnInsider has provided members with news about the Alumni Association and Penn State since debuting in 2007. It's conveniently delivered via email to member inboxes every month.